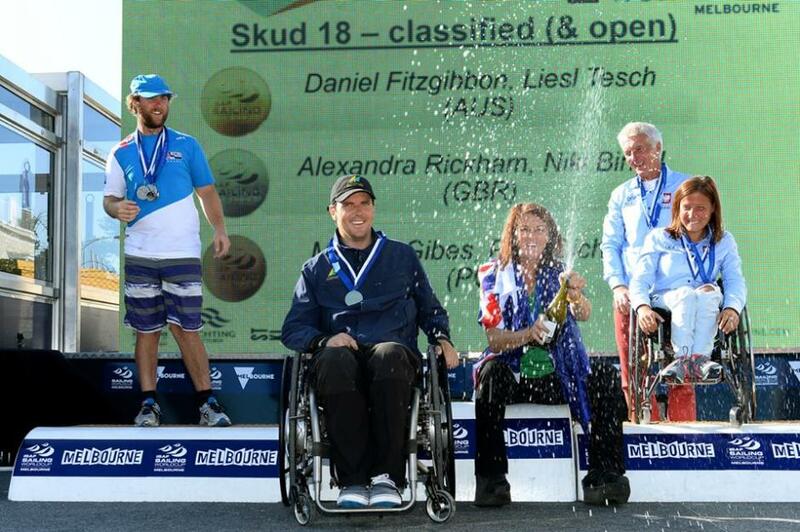 Paralympic gold medallists Daniel Fitzgibbon and Liesl Tesch have won the Sailing World Cup Melbourne in the SKUD18 continuing their unbeaten run since the 2012 London Paralympic Games. The World Cup win comes after the pair successfully defended their title at the 2015 Para World Championships last week. Australian Sailing’s Sonar Team of Paralympians Colin Harris (WA), Jonathan Harris (NSW) and Russell Boaden (WA) followed suit and won gold in the Sonar class. This was one spot up from their silver medal at the World Championships last week. Paralympian Matt Bugg (TAS) completed the Paralympic class medal haul by adding silver in the 2.4mR class. Bugg won Para World bronze last week, which was his first World Championship medal. All of Australian Sailing’s Paralympic crews contested the Sailing World Cup Melbourne and nine months out from the Rio 2016 Paralympic Games Australian Sailing Team’s sailors are looking strong. The team secured three medals at the worlds on Port Phillip last week, winning the Nation’s Cup as the most successful country for the second time in a row, and adding another three, including two gold, at this week’s World Cup. While the Paralympic classes concluded racing today (Saturday, 12 December), it was the penultimate race day for the Olympic classes with the top-ten Medal Races scheduled for Sunday, 13 December. After a blow-out due to gale force winds yesterday, the race officers ran a full race schedule with additional races across the fleets in breezes of 10- 13 knots out of the south. 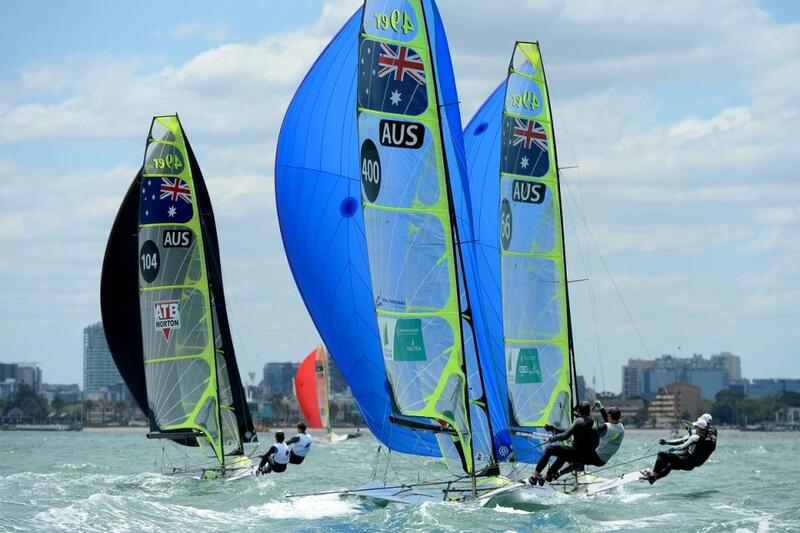 Australian Sailing’s Olympic classes had a strong day with four crews going intoSunday’s Medal Race in the lead. “It was difficult backing up after such a big regatta last week, but on the other hand it was good practice. I think everyone was a bit tired out there but it’s good to back up and still put out a good performance. The good people were still here this week, we had a strong fleet and it was as competitive as the Worlds. Rio is such a tricky place, we really want to do as much as we can to be dominant there and every racing opportunity we get is a bonus. We love sailing on Port Phillip,”SKUD18 winner Dan Fitzgibbon said. Once again Fitzgibbon and Tesch displayed a dominant performance on the water, winning four out of seven races and coming second in the other three, including in both races on the final day. They won the series by six points ahead of Great Britain’s five time World Champions Alexandra Rickham and Niki Birrell. Poland’s Piotr Cichock and Monika Gibes finished third. Australian Sailing Squad’s Ame Barnbrook (NSW) and Brett Pearce (NSW), who came sixth at the Para World Sailing Champs, finished the World Cup in overall fifth. The pair had a strong last day winning the first race and finishing off with a third. In the Sonar, Australian Sailing Team’s Colin Harris, Jonathan Harris and Russell Boaden went into the World Cup with unfinished business after the trio won silver at the Para World Sailing Champs with only one point separating them from the gold medal winning British Crew. “It was pretty tough because we were a bit disappointed about our final position at the worlds. But at the end of the day the team did really well, refocused, got on with the job and got some really good results this week to put us in the gold medal spot at the end,” Colin Harrison said. “There were a few less teams out on the water this week, but a lot of good quality boats so the competition was tough and we had always tight and very enjoyable racing. I’m really happy with the work on the boat and the team has done really well. And a big thank you to our coach Grant (Alderson) for all his input from the coaching point of view,” he added. The team qualified the Sonar last year for the Rio 2016 Paralympic Games and have continuously finished on the podium since then. This was the second World Cup win for the team this year, having won the Sailing Sailing World Cup in Weymouth in June, and the first one on home waters. It finished off a successful season after the team also took home silver at the Sailing World Cup in Hyères in April and gold at the Delta Lloyd Regatta in May. Paralympian Matt Bugg completed the successful Australian Sailing medal haul with silver in the 2.4mR behind world champion Damien Seguin from France. “It was a very tiring, but a really good couple of weeks. I won the first race today, which put me into a leading position, but then had a bad first upwind which meant I got behind Damien who eventually won overall,” Matt Bugg said. “Racing was great and I loved it. It’s been really nice to win my first World Championship medal last week and to back it up with a silver medal today. I have another racing opportunity coming up at our Open World Champs in my home city in Hobart and will head to Rio at the start of next year for more training,” he added. The World Cup podium completes a successful 2015 season for the Tasmanian who finished fifth in the 2.4mR at last year’s IFDS World Championships and has continuously worked his way up the ranks over the international competitions this season. At the ISAF Sailing World Cup in Hyères Matt Bugg won a silver medal and went on to win bronze at the Delta Lloyd Regatta making it his best European season so far. Australian Sailing Team’s Paralympic crews will be heading to Rio de Janeiro in January for a training camp before the European racing season, including the 2016 Para World Sailing Championships in Medemblik, The Netherlands in May. Australia already secured Rio 2016 country qualification for all three Paralympic boat classes at last year’s Para World Sailing World Championships. Only the 470 and Finn managed one race on Friday after gale-force winds resulted in a blow-out day. This made for an intense penultimate race day as crews aimed to secure their top ten Medal Race spots. The 49er Men’s and Women’s skiff had four races, while the Laser, Laser Radial, RS:X, Finn and 470 fleets completed three. After another strong day, Australian Sailing’s Ashley Stoddart (QLD) leads the Laser Radial, Joanna Sterling (QLD) the Women’s RS:X, Patrick and Alexander Conway (NSW) the 470 Men and Carrie Smith (WA) and Jaime Ryan (QLD) the 470 Women going into Sunday’s Medal Races. All three Australian Sailing Laser sailors will be in the Medal race with Mitchell Kennedy (QLD) in medal contention ranked second. “Today’s conditions made it anyone’s game. The wind was patchy and it mixed up the results. The fleet is compressed in the top ten but I’m happy to be at the right end of it all. All I can do tomorrow is worry about myself and make sure I beat the rest of the boys,” Mitch Kennedy said. An exciting final day is expected in the double-points Medal Race in the 49er with Victorian’s Will and Sam Phillips the top ranked Australian Sailing crew in second behind the leading crew from New Zealand. Australian Sailing Team’s David Gilmour (WA) and Rhys Mara (VIC) follow in third. For all results and current standings see below. The Sailing World Cup Melbourne at the St Kilda sailing precinct kicks off the 2016 Sailing World Cup series with racing scheduled from Wednesday, 9 December to Sunday, 13 December 2015. Over 180 sailors from 23 nations across nine Olympic fleets, three Paralympic fleets and an Open Kiteboarding event are contesting the event in Melbourne and are aiming to claim the first gold of the series and qualify for the 2016 Abu Dhabi World Cup Final. Other Australian Sailing Team crews will miss the event due to a date collision; Olympic lead-up training and testing requirements at the Copa do Brasil de Vela starting in Rio de Janeiro, Brazil next week. In the Olympic classes top-ten Medal Races are scheduled for Sunday, 13 December 2015, while the Paralympic classes wrap up on Saturday, 12 December 2015. The Sailing World Cup is a world-class annual series for Olympic sailing. It is open to the sailing events chosen for the 2016 Olympic Sailing Competition. Its centre piece is the ISAF Sailing World Cup Final in Abu Dhabi, United Arab Emirates. Dan Fitzgibbon and Liesl Tesch continued their unbeaten run at Sailing World Cup Melbourne and now have their eyes focused on training in Rio. Report by Australian Sailing team Communications, Photos by © Sport the library / Jeff Crow, 2015.